This chutney has always been my favorite right from the childhood. Now it’s my whole family’s. My kids simply love this chutney. Arjun now-a-days never complain of eating idlis when I serve it with this chutney. He likes only dosas. 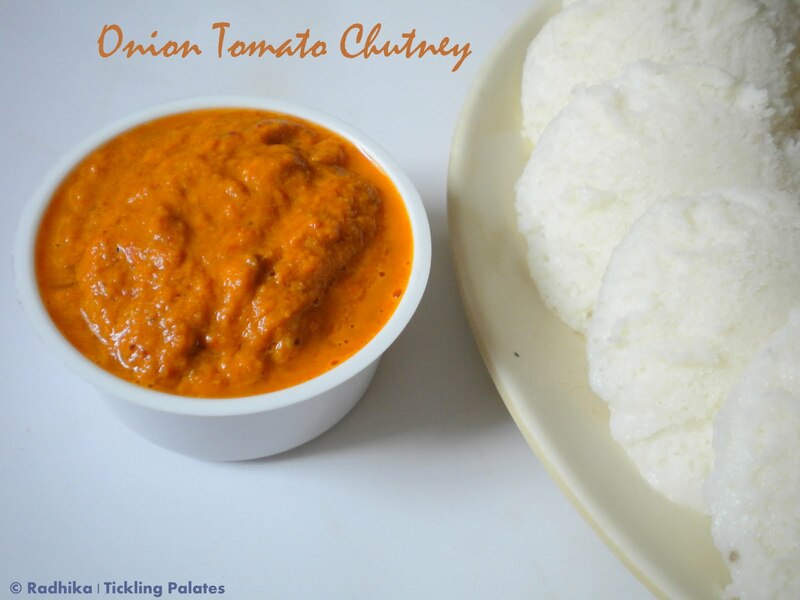 I remember my grandmother plucking tomatoes from her sprawling garden to make this chutney when I used to go to my native for the summer holidays. She even urged us to eat raw tomatoes as it was very good for health. What happy times they were. The garden brings me so many happy memories. They were greens like amaranthus, pudina, coriander, spinach, nattu gongura. Veggie plants like tomatoes, brinjals, lady’s finger, bottle gourd and white pumpkin creepers. Trees like neem, mango, drumstick, plantain. Flowering plants like jasmine, lily, shoe flower, hibiscus, sampangi, marigold. My uncle had also arranged for a big swing to be put in on one mango tree branch. All the kids in the neighborhood assemble in the garden to have a whale of a time. The breeze in the evening spread the fragrance of the flowers around the whole garden and even thinking of those evenings spent under the moon listening to stories from my grandmother gives me a peacefulness and repleteness. Chop the onion and tomatoes. In a kadai heat 1 tbsp of oil, add urad dal and fry till golden brown, now add the red chilies and onion and sauté till they go pink. Now add the tomatoes and sauté till they turn mushy. Keep aside and let it cool. In a mixie grind it to a fine paste or to the chutney consistency using little water if needed. In the same kadai heat the remaining oil and add mustard seeds. When they splutter, add the ground chutney and cook for a minute. Tomato onion chutney is ready to be served with idlis and dosas. You can also add 8-10 of garlic along with onions. In case you are using cherry tomatoes add a small ball of tamarind to provide the sourness to the chutney.